This comprehensive new diagnostic and management guide is the largest, most comprehensive APS compendium published to date. Nearly triple the thickness of the previous edition, it collectively covers nearly 150 diseases, pests, and disorders of blueberry, cranberry, and lingonberry crops. It is ideal for large and small commercial growing operations, nurseries, as well as the advisors that serve them, including universities, extension offices, independent consultants, and diagnostic labs. 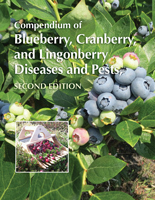 The highly anticipated second edition of this book, published nearly two decades after the first edition, offers the most practical, up-to-date, and comprehensive information in existence for diagnosing and managing diseases and disorders of blueberries (highbush, lowbush, and rabbiteye), cranberries, and lingonberries. It includes nearly 400 images and management recommendations from top researchers across the world, enabling users to more confidently scout, identify, and manage problems in the field before they become economically significant. Noninfectious Disorders (e.g. cold injury, nutritional disorders, oxygen deficiency injury). The Blueberry Certification section offers current and comprehensive information to help users develop and comply with blueberry plant certification standards and practices. The certification program helps ensure that only high-quality plant material, free of targeted plant pathogens, passes through the blueberry production chain. In addition to a useful glossary and index of key terms, this new edition offers an appendix that identifies common names of diseases of blueberry, cranberry, and lingonberry, along with the pathogens that cause them. The Taxonomy, Botany, and Culture of Vaccinium spp.